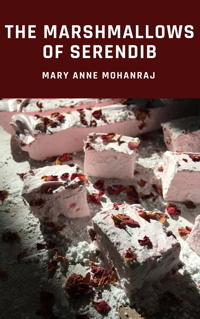 A baker’s dozen of Sri Lankan-inspired marshmallow recipes plus one sweet little story. $3! Patrick Cleary: I just received my chai ginger marshmallows and they are terrific. Soft, pillowy texture and the flavors are light and aromatic, with just enough spice to hit your palate without overwhelming the taste. Sheila Marie: So nice, I ordered twice! They turned out to be the perfect after-dinner treat even for me, who doesn’t eat many traditional sweets. Pretty enough to share with guests too! Rebecca Altes: My rosewater pistachio marshmallows and rosewater lime pistachio marshmallows were delightful treats! The light sprinkling of nuts and buds on top provided just the right amount of extra texture to a dessert that otherwise literally melted in the mouth. Loved the tartness added by the lime. Ami Gandhi: Even this chaivinist loved the chai and spiced coffee marshmallows!